The Coordinating Group on Alien Pest Species (CGAPS) is a voluntary partnership of federal and state agencies and non-governmental organizations whose goal is to protect Hawaiʻi from invasive species that impact the economy, environment, agriculture, and public health. CGAPS works to close the gaps in Hawaii’s terrestrial and aquatic invasive species prevention and response systems through greater coordination, planning, and management. The CGAPS Vision and Action Plan is a big-picture guide for the partnership and staff. CGAPS also identifies priority gaps and spearheads or provides support to address these needs. The CGAPS Strategic Plan is a 5 year plan (2015-2019) that identifies five priority goals with specific actions for each goal. Photo of CGAPS PIO, Christy Martin (second from the left), staff from HISC, USFWS, HDOA, and USDA FS participating in Brown Tree Snake training in Guam. CGAPS was formed in 1995 to address these gaps. Today, CGAPS participants are primarily management-level staff from every major agency and organization involved in invasive species work in Hawaiʻi, including federal, state, county, and private entities. 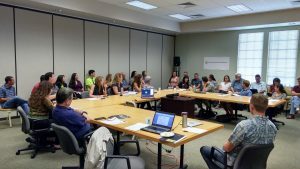 Quarterly CGAPS meetings provide a venue where participating agencies, organizations, and interested parties meet and share updates on invasive species issues and initiatives. CGAPS is led by a Chairperson, Deputy Chair, Chair Emeritus, and Steering Committee to prioritize and plan collaborative projects. The Steering Committee and participants of CGAPS engage in CGAPS inasmuch as the actions and views presented are allowable and do not include prohibited practices for government employees or .the appearance of such practices.